Certainly, Hearst and his Jewish rival at the New York World, Joseph Pulitzer, helped to poison the public mind towards Spain. But this idiotic and incomplete analysis ignores the “big picture” of the Globalist hand which moves the chess pieces. The Spanish-American War was neither “pointless”, nor insignificant. To the contrary, without the precedent-setting features, tactical acquisitions, and adverse side-effects of this unjust war, and the prolonged US-Philippines War which grew out of it, World War I, the Bolshevik Revolution, World War II and all the other horror stories of the past 100 + years would not have been possible. 1- As outrageous and essential as their propaganda was, the belief that a newspaper circulation rivalry between Hearst and Pulitzer caused the war, as the first cartoon above suggests, is just as moronic. 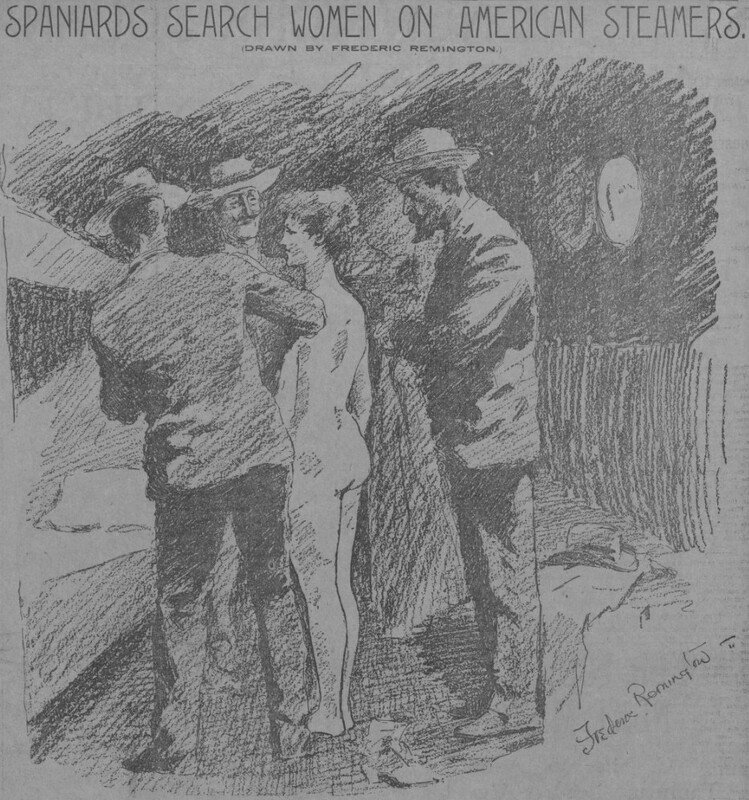 2- The shocking claim of Spaniards strip-searching American women was false. As the turn of the century approached, America was strong, independent, and what the Globalists would call “isolationist” – a stupid propaganda term used to mock the desire to maintain peaceful commerce and neutral relations with foreign countries. The very thought of picking a fight overseas was as foreign to the American psyche as homosexual “marriage” or government housing. The Globo-Zionist crime gang was not nearly as entrenched among the American elite as it is today, but the pernicious influence of the New World Order was growing. Money Masters such as Jacob Schiff, John Rockefeller, JP Morgan and others were already on board with the Globalist movement; as were media moguls like Adolph Ochs (NY Times), and the aforementioned Hearst and Pulitzer. America’s potential as a global ‘hit-man’ for the NWO was not lost upon these One Worlders, particularly in regard to establishing a menacing naval presence from which the emerging U.S. bully could influence the affairs of Asia. Thus was born the idea for the first “Asian pivot” – the theft of the Spanish colonies of Guam and the Philippines. The “problem” of overcoming American “isolationism” posed a challenge for the Globalists. Americans wanted as much to do with the affairs of Asia as they did of Mars or Venus. Besides, Spain wasn’t about to give away territories which it had benevolently ruled for more than three centuries. Concurrent with the desire to take Guam and the Philippines was a movement to annex Hawaii and make it an American territory. But in 1897, the annexation movement stalled due to the strong opposition of native Hawaiians and the inability of supporters to win a 2/3 majority in the U.S. Senate. What’s a Globalist to do? 1- Location. Location. Location. 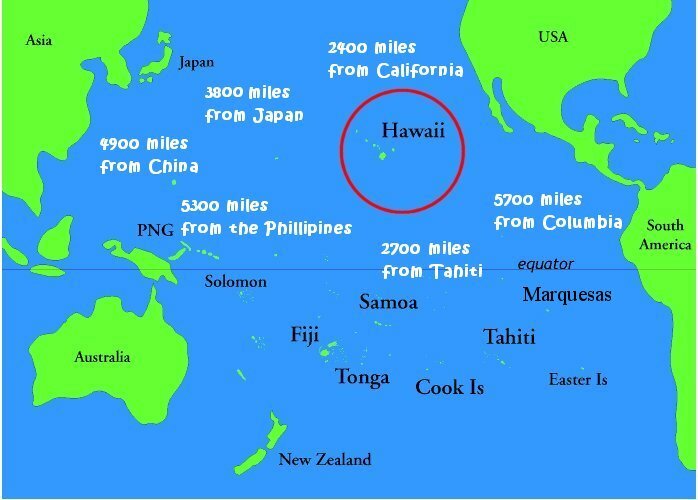 The stepping-stones of Hawaii, Spanish Guam & Spanish Philippines would enable the U.S. to project a presence in Japan’s backyard, with proximity to China and far eastern Tsarist Russia as well. 2- Rothschild, Rockefeller and Jacob Schiff (above) had long range plans to control Asia. It just so happened that the Spanish colony of Cuba was located only 90 miles off the coast of Florida. What if, using the pretext of “Spanish tyranny” over Cuba, the U.S. could pick a fight with “evil” Spain in America’s own backyard? The public might not get too excited about “oppressed” Spanish subjects 5,000 miles away, but certainly, the good and decent American people would never allow the poor freedom-seekers of nearby Cuba to be so oppressed by a European monarchy. And what if, using the cover of this oh-so-noble war for Cuban liberation, the U.S. could then chase the Spaniards out of the Asian Pacific and establish its own bases? Can you see the scam now? Toward these ends, a baseless propaganda campaign was unleashed against Spain, with Hearst and Pulitzer taking the lead in the press while certain U.S. Senators and Congressmen worked from inside DC. 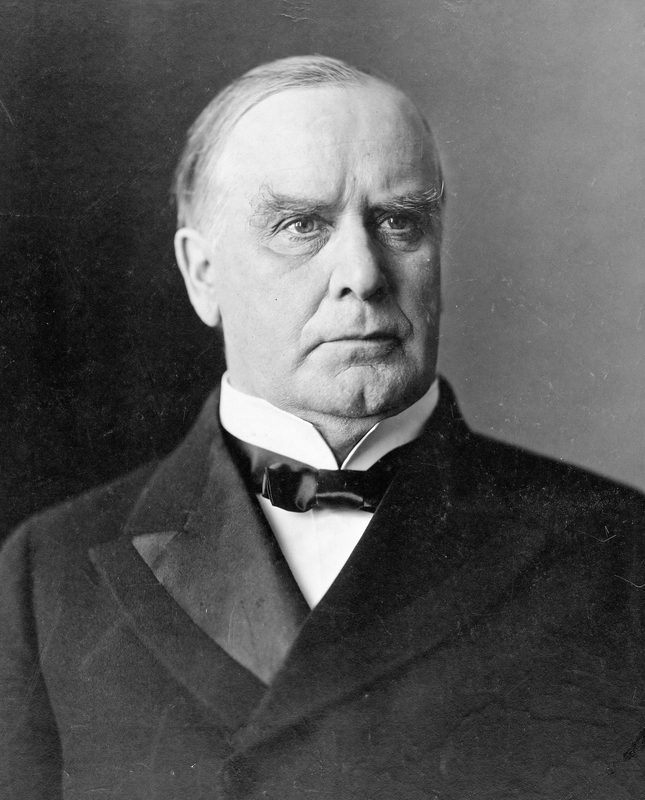 Although the intensive propaganda campaign of 1897 and early 1898 had succeeded in poisoning the public perception of Spain, the reluctance to go to war of many in Congress, as well as that of the conservative President, William McKinley, still had to be overcome. Can you smell the false-flag event coming? President McKinley was not impressed by the anti-Spanish propaganda. Some further “persuading” had to be done. In 1897, The Globalist “Powers That Be” had arranged for the ambitious control-freak, New York City Police Commissioner Theodore Roosevelt, to be appointed as Assistant Secretary of the Navy. In February of 1898, TR, on his own initiative, ordered the USS Maine to provocatively sail into Cuba’s Havana Harbor (controlled by Spain). 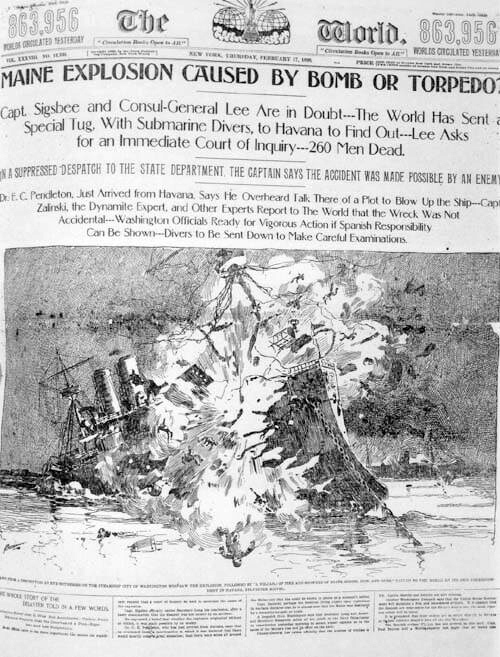 In a remarkable “coincidence”, the Maine “spontaneously” and oh-so-conveniently blew up, killing 251 American sailors. TR and the Yellow Press wasted no time in blaming Spain for the “mine attack“. Assistant Naval Secretary Roosevelt murdered 251 sailors and then blamed Spain for it. Neither the Pope, nor the innocent Spaniards, nor the U.S. President was able to beat back the insane war mania and press propaganda which followed the destruction in the Maine. Immediately after the war declaration, “Assistant” Secretary Roosevelt again took matters into his own hands by issuing an order for America’s Asiatic Squadron – stationed in British Hong Kong in order to “protect commerce” – to destroy the Spanish fleet based in the Philippines. Try not to laugh, dear reader; but many Americans on the west coast saw this outrageous act of aggression as a necessary defensive strike aimed at preventing a Spanish attack on California! 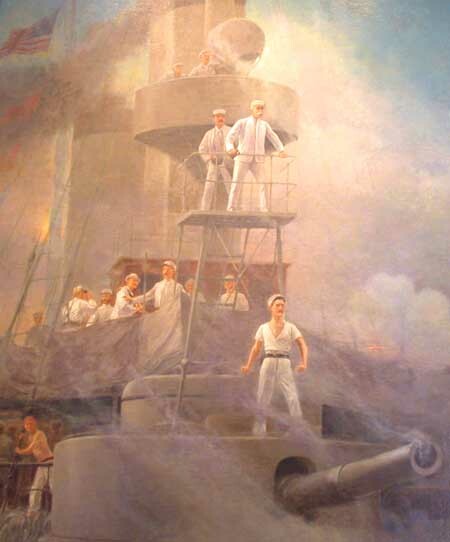 The Battle of Manila Bay took place on May 1. It was a rout. 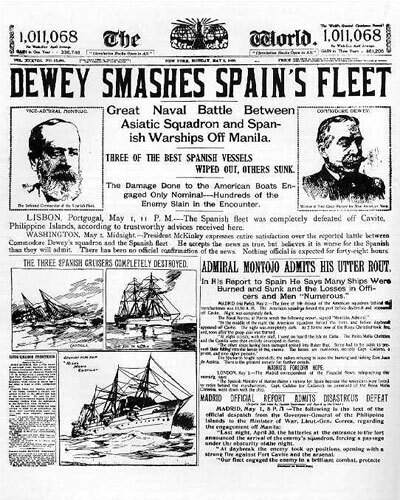 Commodore Dewey not only destroyed the Spanish fleet, but also captured the harbor of Manila – effectively a U.S. body of water ever since. On June 20, a U.S. fleet commanded by Captain Henry Glass, captured the island of Guam – a U.S. territory ever since. And finally, in July, the House and Senate worked their way around the 2/3 Senate requirement for annexing Hawaii by voting on a joint resolution instead. The “emergency” of the war is what finally enabled the establishment of a huge base in Hawaii (Pearl Harbor). Philippines, Guam, Hawaii; yes, the war with Spain turned out to be very good for the future conquerers of Asia. Hey Teddy! Wasn’t this holy war supposed to be about “liberating” Cuba? The war for “Cuba’s freedom” was really all about controlling Asia. The totally lopsided war ended in August, after just 3 and 1/2 months. But not before the war’s most important instigator, Teddy Roosevelt, stepped down from his position and volunteered to “fight”. The grand-standing clown served just long enough to build his resume as a “war hero”. His mythical achievements as the fearless, horse-mounted leader of the “The Rough Riders” and “hero of San Juan Hill” would be hyped by the very same Yellow Press which propagandized for the phony war in the first place. In reality, the Battle of San Juan Hill was only a minor skirmish, fought on foot, in which Americans outnumbered Spaniards 15-1! Just three months after the war had ended, Roosevelt was elected Governor of New York State. He had campaigned vigorously on his puffed-up war record, winning the election by a historical margin of just 1%. Then, as now, dumb Americans loved their “war heroes”. The following year, 1899, McKinley’s Vice President, the equally conservative and pro-“hard money” Garret Hobart, died of a “heart ailment” (or poison?) at age 55. The same warmonger / “progressive” faction that had imposed the Spanish-American War upon McKinley, would now impose Roosevelt upon the reluctant President McKinley. In 1900, after an astonishingly rapid climb up the political ladder, the fiendishly ambitious TR was just “a heartbeat away” from the Presidency. 2- Vice President Garret Hobart (r) died suddenly. Was he poisoned to make way for TR? 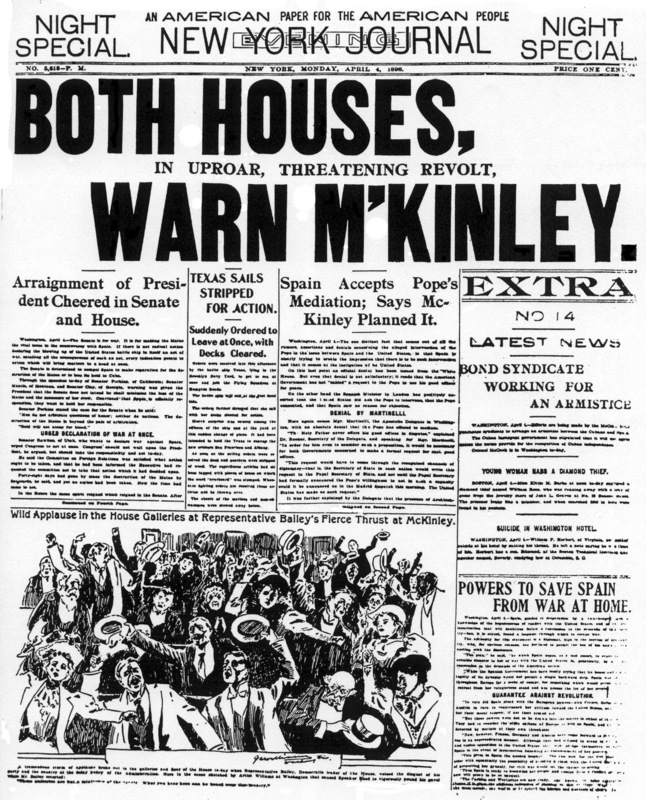 3- With TR just “a heart beat away” from power, the Globalists need only to kill the conservative McKinley. In September of 1901, President McKinley was assassinated by Leon Czolgosz, a Red terrorist-anarchist and devotee of the New York Anarchist-Communist Jew, Emma Goldman. How convenient! Pinko-Progressive Teddy Roosevelt became President and immediately began accelerating the process of converting America towards socialism at home and imperialism (New World Order) abroad. TR waged a brutal war against the ex-Spanish colony of the Philippines. During TR’s war of aggression, 5,000 Americans and 20,000 Filipinos were killed, with as many as 100,000 more natives dying of disease. This was the Philippine independence movement’s reward for rising up against Spain, based on America’s empty promises. The formerly Spanish-speaking natives were then converted to the English language, which they speak to this day. 1- A Red’s bullet put a “Progressive” into the White House. 2- Under TR’s reign of terror, Philippine rebels were tortured..
3- Cartoon mocks TR and the Banksters as being fans of Karl Marx. In 1903, irritated by Colombia’s request for better terms for what was to become the Panama Canal, TR ordered a fake revolution in Colombia. The result was the newly formed puppet state of Panama. Colombia got screwed out of lease payments! In 1905, TR, with Asian-Pacific naval bases now in hand, brokered a peace deal between Russia and Japan. Jacob Schiff’s money and TR’s anti-Russian peace deal helped to weaken the Tsar, who would be overthrown by murderous Reds in the decade to come. For this contribution towards anti-Russian Globalism, war-loving TR was awarded the phony Nobel Peace Prize! In 1907, the megalomaniac TR sent “The Great White Fleet” to sail around the world as a show of intimidation. In 1908, one year after the Bankster-engineered Panic of 1907, TR established the “National Monetary Commission” to study the crash and make suggestions. Nelson Aldrich, an in-law of the Rockefellers, was named Chairman. The NMC suggested the establishment of a Central Bank for America – which will eventually come into being in 1913 as “The Federal Reserve”. Yes, indeed. TR did quite a bit of damage to America and, by extension, the world; and none of it would have been possible were it not for the Spanish-American War which created him, after he created it. 1- Psycho TR’s ‘Great White Fleet’ – USA! USA! USA! 2- Nelson Aldrich, David Rockefeller’s maternal grandfather, will help Schiff, Warburg, Rockefeller and Morgan to set up the criminal Federal Reserve scam. 3- Mark Twain despised Roosevelt. After a 10 year run of killing U.S. sailors and Philippine natives, ex-President Roosevelt took to killing elephants, rhinos, leopards and lions as a hobby. The legal, historic and psychological precedents for America going overseas to fight wars and impose puppet regimes was also established. Without which, US entry in World War I (just 19 years later) would not have been possible. An imperialistic American/NWO naval foothold was established in the Pacific (Philippines, Guam, Hawaii). Without which, the 1905 undermining of Tsarist Russia, the 1930’s U.S. influence over China, and the associated harassment and provocation of Japan (World War II) would not have been possible. Those four monstrous ‘mutations’ alone spawned every other disaster of the past 116 years, making the “pointless” Spanish-American War, in many ways, one of the most important ‘watershed’ events in American and world history. Indeed, the Spanish-American War was the ‘Typhoid Mary” of the world disasters which followed, and continue to unfold today. July 18, 2015 in REALPOLITIK - The Geo-Political Chessboard.